Yes, that much awaited month of June has arrived! Here in my mountain home it has arrived, bone dry. We have been hoping for rain, but it has eluded us, and the fires have started. You have probably heard of the large one devouring acres in the Gila; we have had a smaller one here, in the Hondo Valley, which has been 90% contained at last count. Fire is the dreaded word that we mountain dwellers abhor, and do everything in our power to avoid. In our village of Ruidoso outdoor smoking is prohibited, and I hope all our visitors adhere to that. It is not that we don’t want you enjoying our mountains and coolness, it is just that we ask you respect our environment and our home. Other than that, the summer season is in full swing. 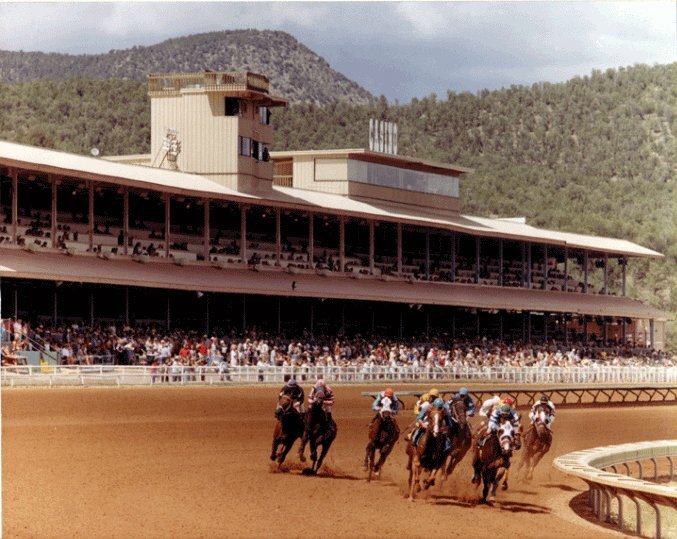 The racing season started on the Memorial Day weekend, and we had quite a crowd at the Ruidoso Downs Racetrack. I say “we” because I am part of that scene, being employed at Billy the Kid Casino adjacent to the track. Parking is at a premium, and when we find one, we are jubilant. I am not going to reveal the parking space which I have found, not too many people know about it. It is not that far from the building, but I still get walked to my car by the security guards, God Bless them. I still love my job, it has taken my life into new directions, having people to talk to, and laugh with. It has done away with a lot of the lonely times. After three years I still miss my hubby, but have learned to live with the loss. This month we will be celebrating the 50th birthday of my youngest, and his siblings will be here to rib him about old age. Not too much ribbing as they are now all over fifty, and I still think of myself as young! To me, age is just a number; there are now a few more aches and pains, but I have been blessed with good health and good genes; my mom lived to 99! There is sadness within my familia, as two brother in-laws are deteriorating in health; it will be only a matter of time before they too leave this earth. I talk to my sisters often, and offer whatever encouragement I can, and I travel to El Paso at least once every three weeks to be with them. My sister in California is the one most out of reach, but always in our hearts, prayers, and thoughts. Another sadness is the fire that devastated my son’s home in El Paso; I went to see it on my last trip there, although he had asked me not to. My view of the house was of a burned out shell, the roof had been removed and what could be saved was taken, not much left. They are lucky to be alive, thanks to their little dog and a neighbor who woke them. As I told them, things can be replaced, but not human life. The jubilation of June is now taken one day at a time. Love and good health to all.